There are few fabrics throughout the world quite as distinctive as denim. This “everyman” clothing has become ubiquitous throughout the fashion industry; finding homes in both the worlds of high-end design and blue-collar work apparel. Fans of the timeless blue fabric may already know that some of the world’s best denim comes from Japan. Its highly renowned quality is due largely in part to the country’s meticulous, traditional indigo production; the dye used to give denim its signature blue hue. For an idea of what makes Japanese indigo so special, let’s take a closer look at this time-honored, traditional practice. 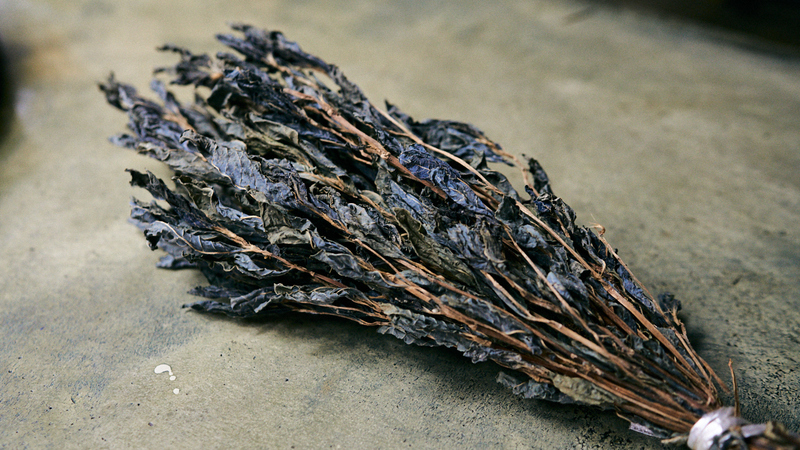 What Makes Japanese Indigo so Special? The Japanese production of indigo dates back to the 6th or 7th century, during which time it was available exclusively to wealthier members of society. 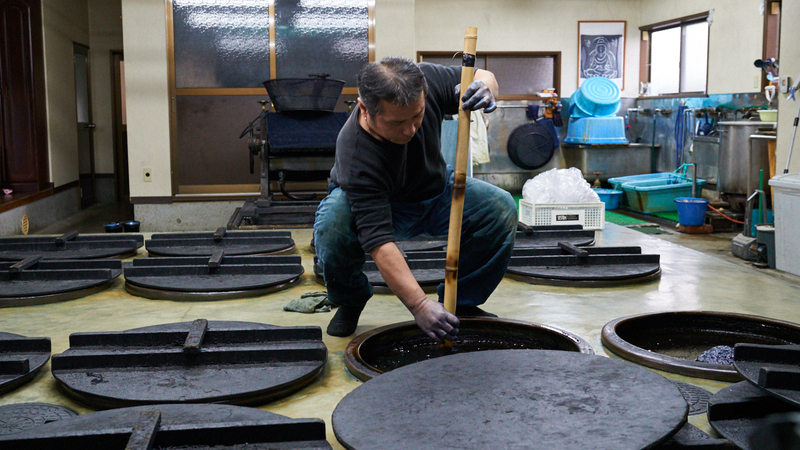 What makes Japanese indigo dye unlike any other in the world is that it is produced as a result of fermentation. Though incredibly time-consuming, this process imbues the dye with several unique properties; including dirt, fire and antimicrobial resistance. Because of this, it quickly became a popular clothing choice of samurai throughout Japan. In time, indigo became more widely accessible; available to not only the wealthiest members of society, but to commoners as well. However, Japan’s love affair with this deep blue dye never faded. Today, a handful of dedicated craftsmen throughout Japan still create indigo dye using the traditional fermentation techniques. 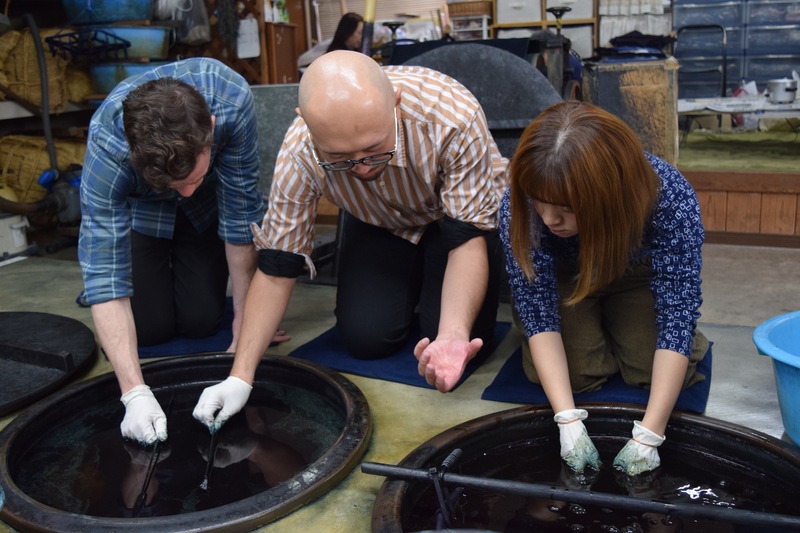 The Japanese method of creating indigo dye is truly a labor of love. Leaves are carefully gathered from the indigo plant and placed under thick straw mats for months on end. In order for the leaves to properly ferment, very specific conditions must be maintained at all times. Workers must perform daily maintenance to ensure that the leaves have proper airflow and stay at a temperature around 60 degrees Fahrenheit. The entire fermentation process, from the time of picking the leaves to completion, takes roughly one full year. After months of patience and dedicated work, the final result is something that resembles dirt, but with a pungent, vinegary aroma. 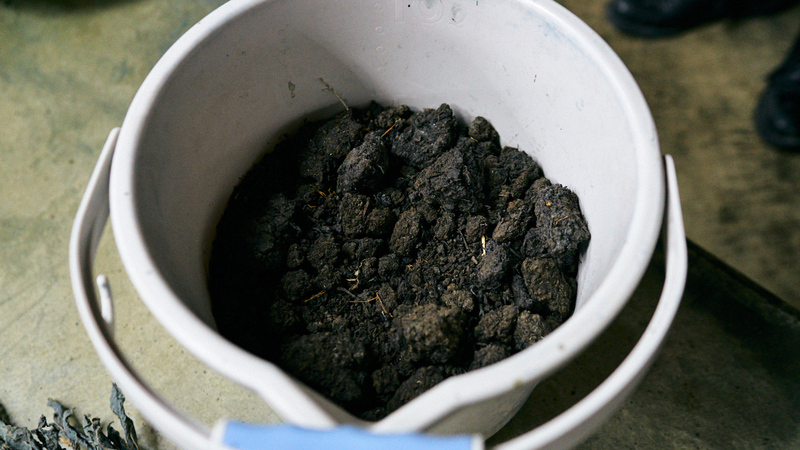 This product, known as sukumo, serves as the basis for indigo dye. While sukumo is made in several locations throughout Japan, Tokushima prefecture, on the island of Shikoku, is responsible for over 80% of the total production. Tokushima’s seemingly endless mountainous landscape is home to some of the lushest countryside in all of Japan. This is due largely to its location along the vast Yoshino River. When the river floods (a fairly common occurrence), the surrounding soil is enriched with nutrients from the water. As a result, indigo, a particularly nutrient-hungry plant, has come to thrive on this tiny island. 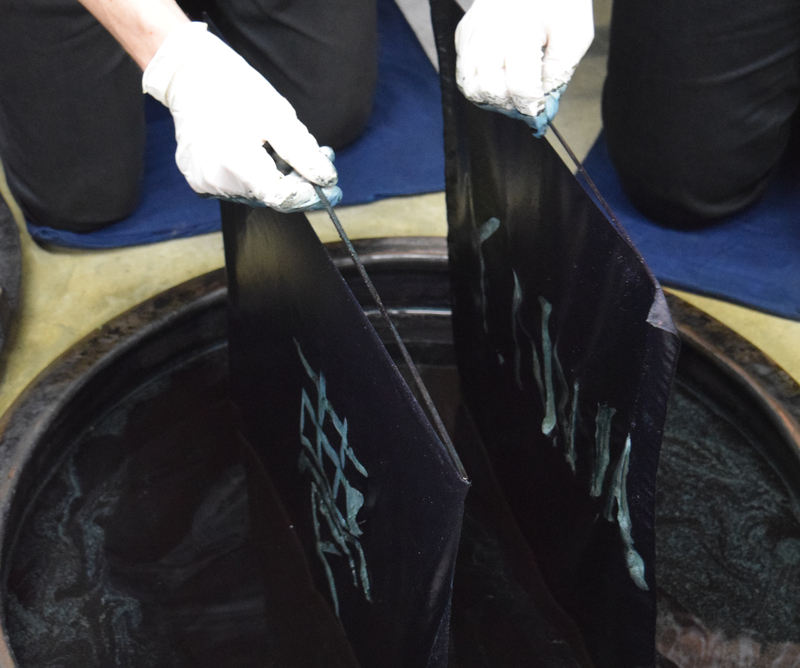 The traditional style of Japanese indigo dyeing is known as aizome. To witness it firsthand, it is easy to see that it is just as much an artform as it is a means of production. Aizome craftsmen take pride in their work; a fact clearly evident in every finished piece of cloth that passes through their hands. One such place in Tokushima where you can not only watch indigo dyers in action, but take part yourself, is at Hon-Aizome Yano Kozyo. This independently-owned and operated business has been producing indigo dye since 1986 and gladly welcomes interested visitors. Their production area is reminiscent of a large car garage turned workshop. 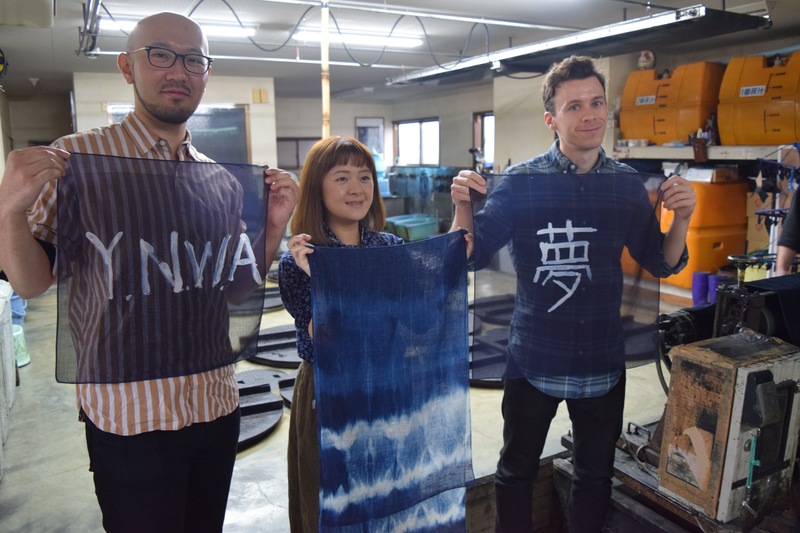 To the left, the founder, Yano-san, with his dark blue hands stained from hours of work, stirs large sunken vats of indigo dye; the sharp smell of which is overwhelming when you first arrive. To the right, two women and a young girl work diligently on a small tatami mat sitting area, ironing and folding freshly dyed items, ready for sale. The entirety of the scene invokes a homey feeling. In a time where mass produced goods are the norm, there’s something nostalgic and comforting about seeing things made by hand, and the faces of the people who make them. Hon-Aizome Yano Kozyo offers a variety of items for guests to purchase and dye themselves, from small handkerchiefs to long, billowy chiffon scarves. Once guests have made their choice, the staff members expertly guide the entire process from design to the dyeing itself. Indigo dyed items are often famed for their beautiful designs, which can be achieved in one of two ways; a tie dye method achieved through tying a series of knots in the fabric, or by painting a design onto the fabric with clear wax to prevent the dye from soaking in. Preparing your design can feel daunting due to the implied permanence of the indigo dye soon to come, but its best to not overthink it. After all, when it comes to handmade crafts, the beauty is in the imperfections. The minor (or major) flaws add uniqueness to the finished product and truly set the work apart. 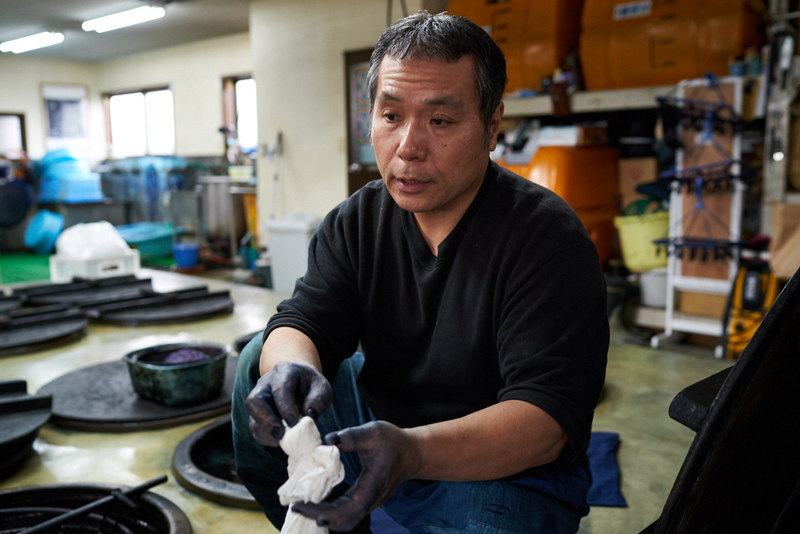 After the design process is completed, Yano-san carefully instructs guests on the art of indigo dyeing. 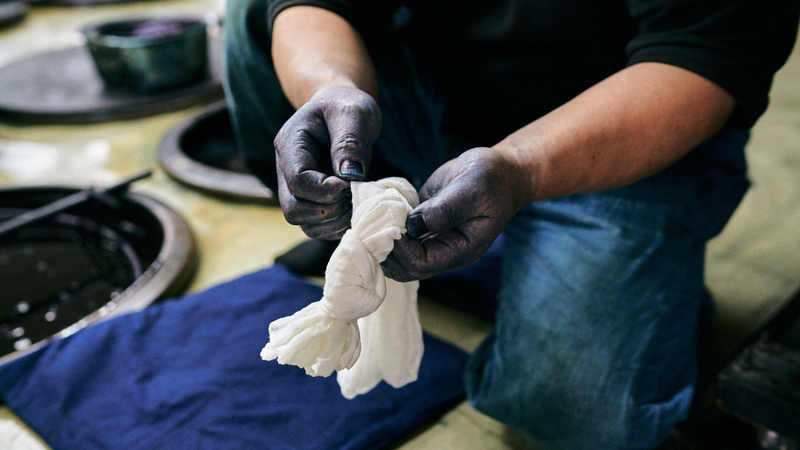 Just as the indigo-dyers of hundreds of years past, dyeing today is a manual process, done on hands and knees while leaning over a large metal vat of inky blue indigo dye. After attaching your cloth to a wooden stick, it is slowly lowered into the dye, where it sits for roughly one minute. On Yano-san’s instruction, it is raised out of the liquid, allowed to drip for another minute, and then the entire process is repeated again for ten times in total. 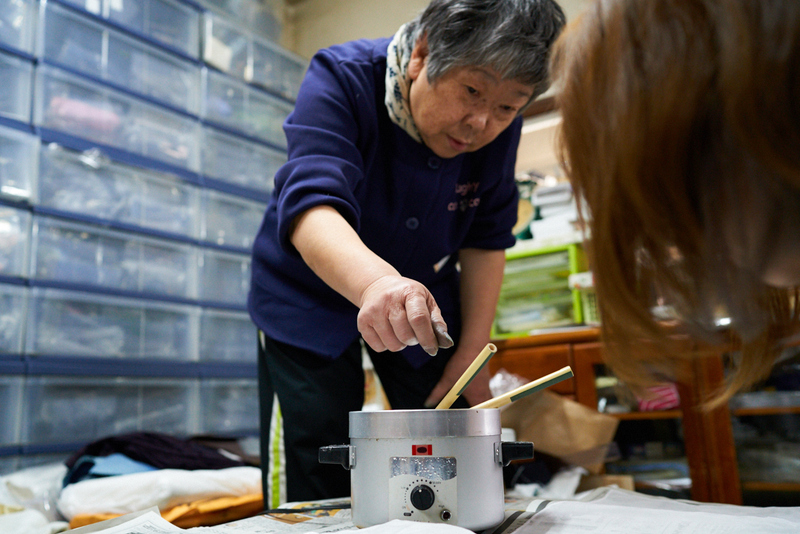 One might be worried about working in such close proximity to “chemicals”, but as it turns out, the dye used in Yano-san’s workshop is entirely natural. To prove this fact, he will occasionally dip his finger into the vat of indigo dye, and upon emerging, place it directly into his mouth. The dye’s flavor is difficult to describe, but it can be described as an umami taste, and leaves a slight tingle on the tip of your tongue from the wood ash lye used in its production. 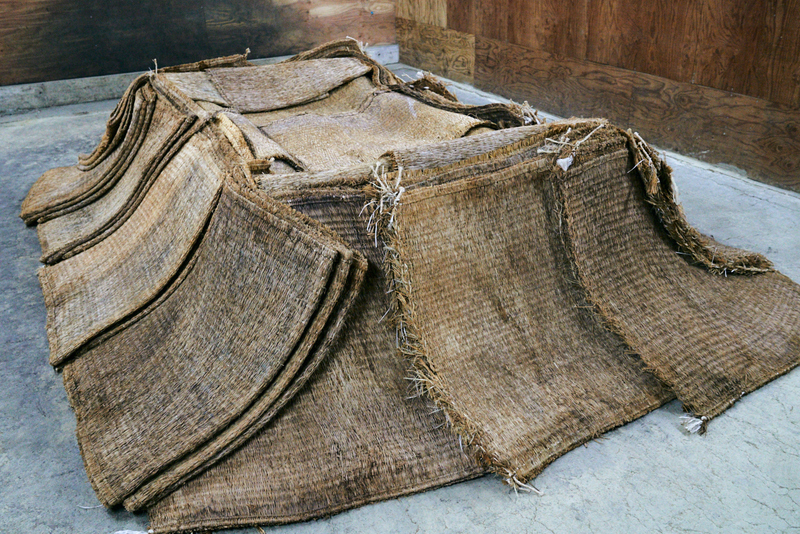 Once the dyeing is completed, the fabric will be washed and dried. The entire process from start to finish takes just under an hour. Guests at Hon-Aizome Yano Kozyo can leave with their beautifully handmade creations that same day, making it a perfect choice for people spending just a brief amount of time in Tokushima. 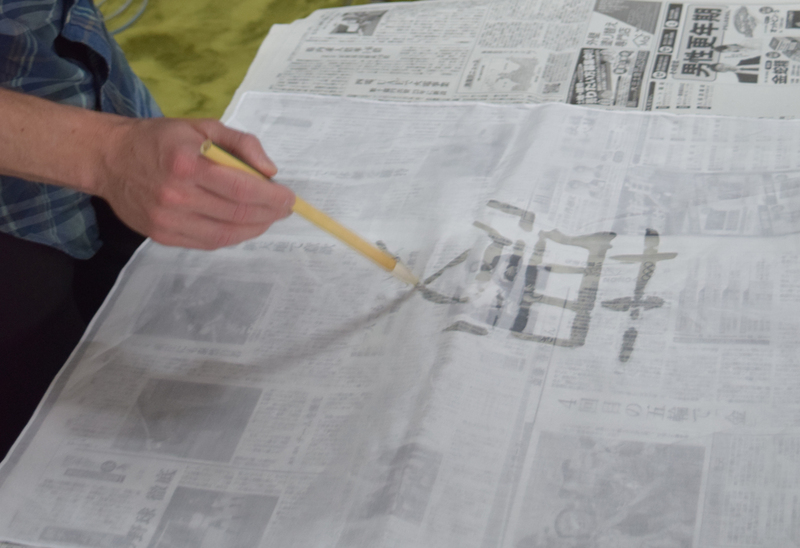 Guests interested in visiting Yano-san’s workshop should make reservations at least one week in advance. 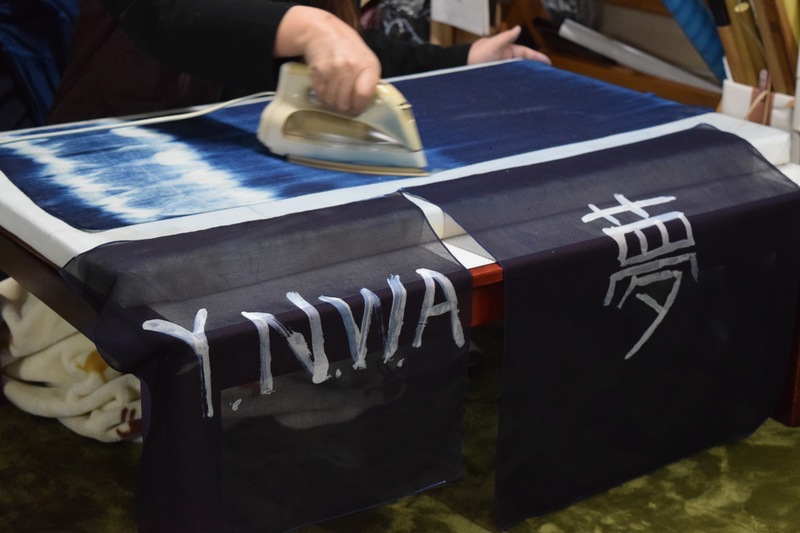 The tour is only offered in Japanese, but English-speaking guests are still more than welcome to take part in the dyeing experience and are encouraged to make reservations via email. Appreciators of high-end and locally sourced fashion will enjoy a visit to BUAISOU during their stay in Tokushima. Though only in business for a handful of years, this dedicated team of indigo artisans have built an incredible reputation for themselves, both domestically and abroad. 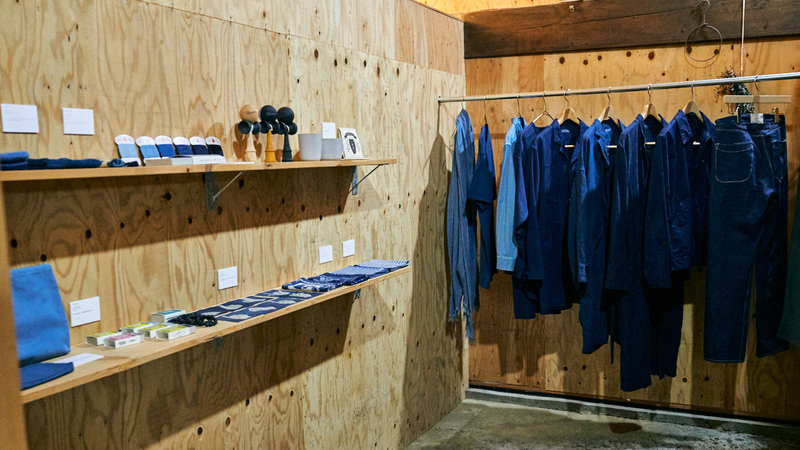 Owning every step of the production from growing the indigo plants to hand-dyeing original merchandise, their “farm-to-closet” business approach has rapidly put Tokushima indigo on the global fashion map. 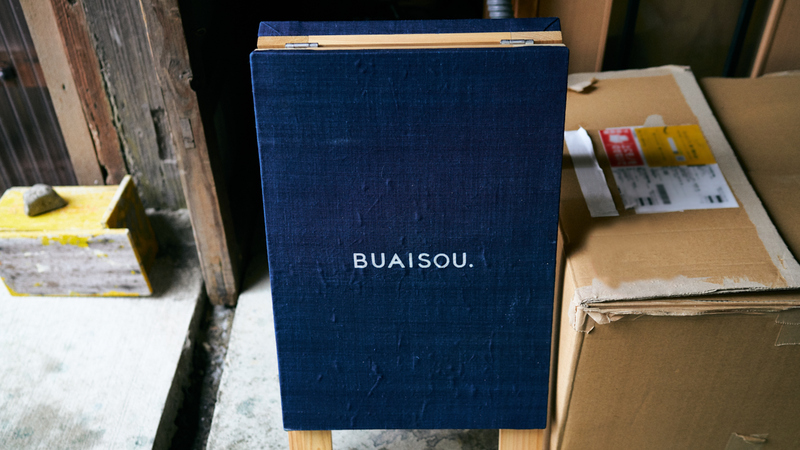 For the craftsmen at BUAISOU, indigo is more than just a way to make a living. It’s a way of life. The passion and dedication poured into their work is apparent in every item they sell, from work shirts to shoelaces. Their quality craftsmanship has not gone unnoticed, finding their products sold internationally in eight different countries, and forming partnerships with numerous luxury brands around the world. Those wishing to visit BUAISOU’s farm and workshop to see their incredible work in-person will first need to make a reservation through their website. Please contact them at least one week in advance to plan your visit.